If your greatest passion is medicine and you aspire to be a doctor in the future you can not miss this magnificent game in which you can test your skills for it. You will have multiple patients waiting at the clinic and each of them has a different condition. Get the first of them and have him lie on the stretcher to begin the exploration. We will use our thermometer to see the fever and we will begin to apply different treatments on their wounds. We will have to make them recover their health completely and, finally, we will make them regain strength with a delicious fruit smoothie. Serve all your patients and get everyone to leave the hospital very happy having recovered their health. 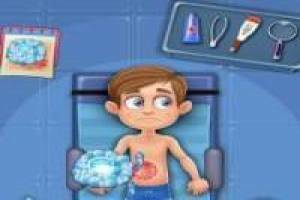 Enjoy the game Dream hospital, it's free, it's one of our hospitals games we've selected.